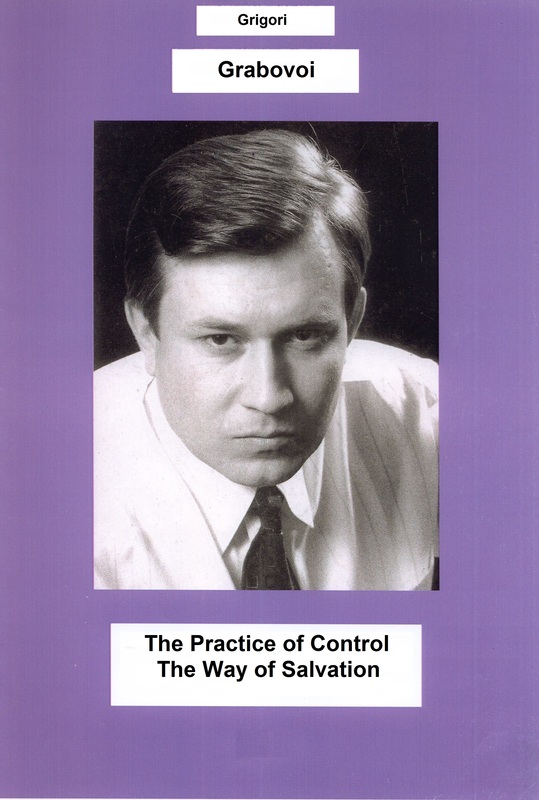 The practical field of the Teachings of Grigori Grabovoi, which is described in six-volumes of “The Practice of Control. 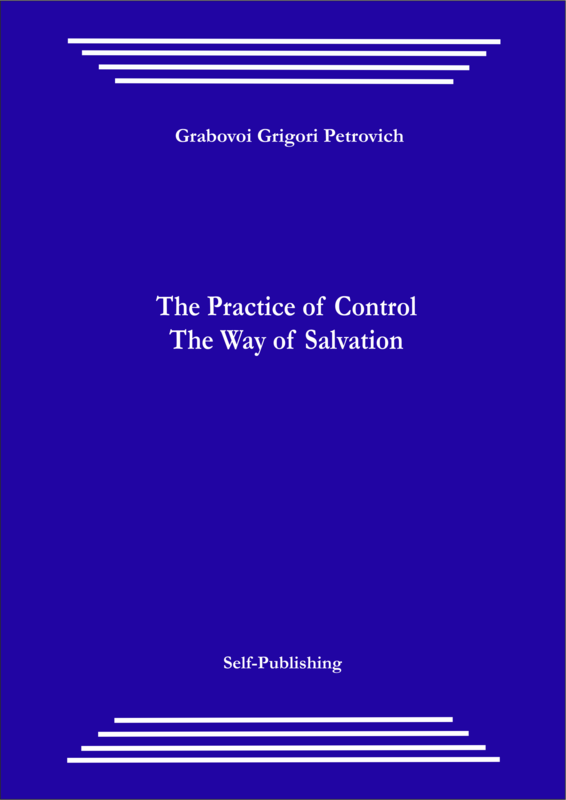 The Way of Salvation” with the first three volumes including the personal results of Grigori Grabovoi on control for salvation, and volumes 4, 5, 6 including the results of people who practice the Teachings of Grigori Grabovoi, allows to make a clear conclusion that the effectiveness on the declared goal of salvation and harmonious development of all texts of Grigori Grabovoi in printed and electronic form, and of images in these texts, all audio recordings with his voice phonograms, all video recordings with his image has been proven. Legally binding documents and the Court confirmed that the results set out in the work “The Practice of Control. The Way of Salvation” really corresponded to reality. The fact that Grigori Grabovoi has objectively established ability of accurate controlling forecast of the future events, ability of controlling clairvoyance and so on, suggests that the creator of the Teachings knows exactly why he teaches and how to teach the knowledge of the Teachings. Because when Grigori Grabovoi created the works of his Teachings he first applied the forecast oriented to eternal life control, and only then informed the text of the Teachings, so this establishes that the texts of the works were precisely formed to ensure eternal life. 1) Vibration the front fender (“FF”) at a height of h = 1700 m because of the above zero temperature of the external air, and the offset of limitation of “FF” on the number M = 0.4 to a height less than assigned by the flight task (H = 2000 m). From the protocols of Grigori Grabovoi’s forecasts on the docking of orbital station “Mir” of the Russian Federation and space shuttle “Atlantis” of the United States for the period from September 27, 1997. Item 1: The docking of space orbital complex “Mir”, Russia and space shuttle “Atlantis”, United States planned at the end of the day of September 27, 1997, will take place. Item 2: There will be a deviation from the axis directly before the docking. Based on the comparison of the forecasts of Grigori Grabovoi with the practice we conclude that all the forecasts of Grigori Grabovoi were a hundred percent confirmed. One hundred percent confirmation both of each forecast and throughout the volume of the task suggests that Grigori Grabovoi, when diagnoses the space technology only through his clairvoyance, instantly gives hundred percent confirmed forecast throughout the total volume of the task. Based on the described facts we can conclude that it is necessary to use clairvoyance in the prevention of malfunctions and accidents in the space technology. 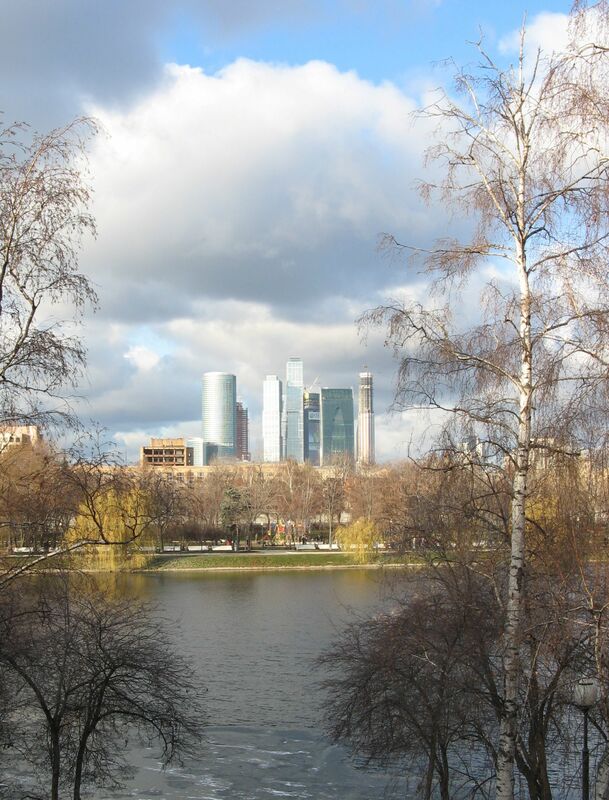 The task was given in the Space Mission Control Center of the Russian Federation. The task was made by the deputy head of the Space Mission Control Center Blagov Viktor Dmitrievich. The task was formulated in the presence of the employees of the SMCC, Professor Viktor Timofeevich Novichkov and corresponding member of the MAI Yuri Georgievich Titov. From the statement by Valery Ivanovich Kornilov, head of the Department of chemistry of carbohydrates of the Research Institute of Physical and Organic Chemistry of Rostov State University, Soros Associate Professor of chemistry of natural compounds of the RSU, informing that Grigori Grabovoi by using his abilities of clairvoyance, accurately described the speed of the process of cyclization-recycling of organic matter. The solution of the task, which was formulated in Rostov-on-Don, took place in Moscow (Solyanka Street, d. 14/2, Office # 110). The written reply was given by Grigori Grabovoi almost instantly: transformation occurs at a rate 5 times per second for a solution at 25°С. This data were subsequently confirmed after analysis of the NMR spectra. It is possible to solve this problem by the method of nuclear magnetic resonance and quantum-mechanical calculations. Though Grigori Grabovoi was neither a chemist in general not the expert in this narrow field of organic chemistry and had no special techniques of study of the structure of matter, he immediately staying in his office (Moscow, Solyanka, 14/2) gave a written opinion in favor of the structure (II), moreover he made an additional conclusion that the third structure not taken into account by us can be realized in the magnetic field. Grigori Grabovoi could not have known in advance that the authors observe the mentioned process exactly in the magnetic field, which could affect the nature of the intermediate particle. This conclusion is consistent with our views received on the basis of the experiment, as well as with the views of other experts in this field. Based on the above, we consider that the forecast given by Grigori Grabovoi is based on the ability for the foresight of processes occurring at the molecular level. From the minutes of the experimental checks of the ability of Grigori Grabovoi to determine by extrasensory method accidents, the number of the accident survivors and their location, failure of ventilation in mines based on the scheme. The aim of the experiment according to the contract with the administration of the President of the Russian Federation was to establish the ability of Grigori Grabovoi, born on November 14, 1963, in village Kirov, Kirov district, Chimkent oblast, Kazakh SSR, birth certificate series II-OG No 463794, to determine by extrasensory method the locations of accidents, the number of injured survivors and the failure of ventilation in the mines based on the scheme. Grigori Grabovoi by extrasensory method almost immediately after receiving the scheme of mine “Vorkutinskaya” of JSC “Vorkutaugol” correctly determined the places of accidents on the diagrams, accurately determined the number of the accident survivors and their location, correctly defined the places of airing failure without time for questions and without knowing the coordinates of the drifts on the ground. Based on the works of the Teachings of Grigori Grabovoi, you can create learning organizations, universities, which get, transfer, preserve and protect the knowledge of Grigori Grabovoi. Such organizations can change flexibly and adaptively in response to new knowledge and context of the situation. People in these organizations constantly expand their capacity to create the results they really aspire for; they master new large-scale ways of thinking; people discuss there together the best practices, various questions or skills, which they are eager to learn better; there they constantly learn how to learn together; they help people, who are not members of those organizations, to master the Teachings of Grigori Grabovoi. Taking into consideration the mentioned possibility of application of the works of Grigori Grabovoi, the effectiveness on the declared goal of salvation and harmonious development of all texts of Grigori Grabovoi in printed and electronic form, and of images in these texts, all audio recordings with his voice phonograms, all video recordings with his image is almost 100%. The methodological guidelines of the Teachings of Grigori Grabovoi are actually represented in all of his works and make it possible to get practical results from the use of the techniques, principles and methods of the Teachings. 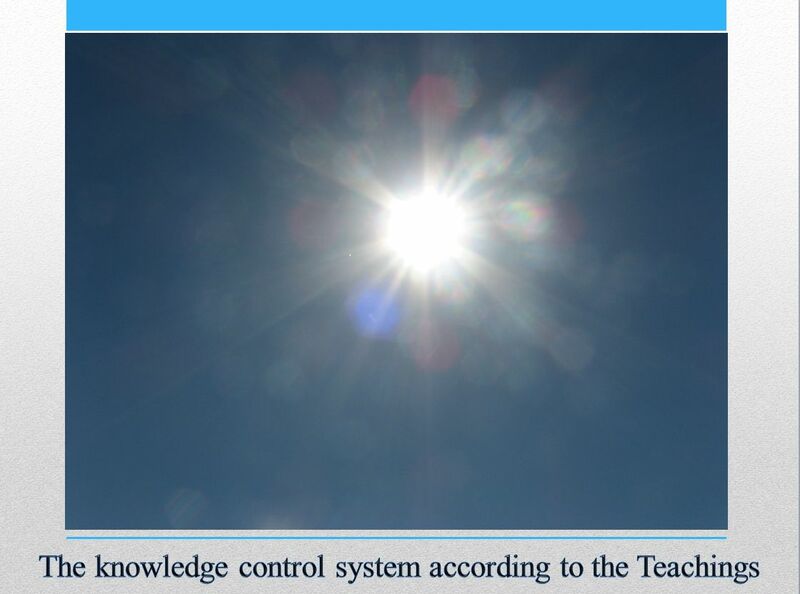 The knowledge control system according to the Teachings is a set of repeated on a regular basis management procedures that are realized through the development of consciousness, and appointed to increase the effectiveness of collection, storage, distribution and use of valuable information from the point of view of ensuring eternal life. Culture is the most important issue in the field of knowledge, since this is exactly the human factor (value, level of ties or exclusion in society) that creates the knowledge control system or hampers its creation. High moral and cultural values of the Teachings of Grigori Grabovoi allow people to create effectively the Teachings knowledge control system aimed at the quick securing of all conditions of eternal life of people. Human interactions and relationships are often referred to as “social capital”, the element of the total capital of the humanity. For eternal life of all people the Teachings of Grigori Grabovoi explains how to develop such “social capital” up to infinity. The technology alone cannot solve the problems of knowledge or create a knowledge-sharing environment although it is a very important element of the knowledge control system. Application of modern information technology should in no way eliminate the necessary elements of habitual interpersonal communication, because they make the process of knowledge sharing in the society more intense. In this regard, attention should be given to not only the material and technical part, but mainly to organizational matters. In confirmation of this, the book of Grigori Grabovoi “The Resurrection of People and Eternal Life From Now On Is Our Reality!” says that the knowledge must be transferred from person to person. The structure of knowledge of people, who practice the Teachings of Grigori Grabovoi, consists of practical, theoretical, strategic, commercial and other knowledge. People to ensure eternal life according to the Teachings of Grigori Grabovoi extract information, build conclusions and generate new knowledge with the aim of increasing the strength of spiritual development, improvement of the quality of the manufactured products and services that provide eternal life to all without exception. The control of each of the above elements included in the knowledge control system is based on the use of the processes we have already examined, i.e., creation, storage, use and distribution of knowledge in the society. Thus, from the point of view of the knowledge control according to the Teachings, the essence of community that practices the Teachings of Grigori Grabovoi, lies in its capacity to create, transfer, gather, integrate, and exploit the knowledge as assets. As a result, the knowledge forms competencies, which in turn serve as the basis for the creation of products and services offered by the community. In other words, the knowledge control for ensuring the eternal development according to the Teachings of Grigori Grabovoi, which integrates many different disciplines such as personnel management, marketing, economics, psychology and computer science, is the technology of the infinite future of all humanity and each individual that allows people right now to ensure eternal life to each person and all the others. The knowledge in the works of Grigori Grabovoi are conceptually set out to allow carrying out continuous self-learning. The author’s works of Grigori Grabovoi contain created by him knowledge of salvation and eternal harmonious development that cover the main areas of human activity. The control of the knowledge contained in these works gets out to the practical level defined in these works. The theory of the new society has been developed in the Teachings of Grigori Grabovoi; the main values of this society are knowledge, information and creation, the development of spiritual potential, and ensuring eternal life of all. The works of the Teachings include the developed informative and practical bases of eternal life knowledge control that can be characterized as a widespread concept of knowledge control in all the spheres of activity including science and education. Through the use of the works of Grigori Grabovoi direct formation of the “technologies of the knowledge control” takes place as a set of specific methods and techniques to ensure free circulation of knowledge, their generating and sending them into the sphere that ensures eternal life of every person and all living things. The aim of the training, based on the curriculum on the Teachings of Grigori Grabovoi and the results of the practice of Grigori Grabovoi on control for the purpose of salvation as well as of the results of people who practice the Teachings of Grigori Grabovoi, is the creation of the system of knowledge control and its use at the level of educational institutions, which teach eternal life to ensure eternal life to all. This shows that the acquisition of knowledge and the knowledge control according to the Teachings of Grigori Grabovoi, being at the intersection of different disciplines, is a brand new and actual in today’s environment direction, that makes it possible to really save the world from a possible global catastrophe, and to ensure real eternal life to all the people and all living things. The knowledge of the Teachings of Grigori Grabovoi represents an independent value, moreover it gives rise to multiplicative effect related to other areas of human activity, and simultaneously it contributes to the level of development effectiveness of all areas of human activity towards everlasting development of all people. Thus, in the contemporary world, the knowledge, which is difficult to replicate as the asset and the method of its accommodation, becomes the source of advantage instead of a prime location at a certain time. Moreover, the focus here is not only the knowledge creation, but also its movement and use in the society due to understanding by the members of the society of the need of eternal life of all. 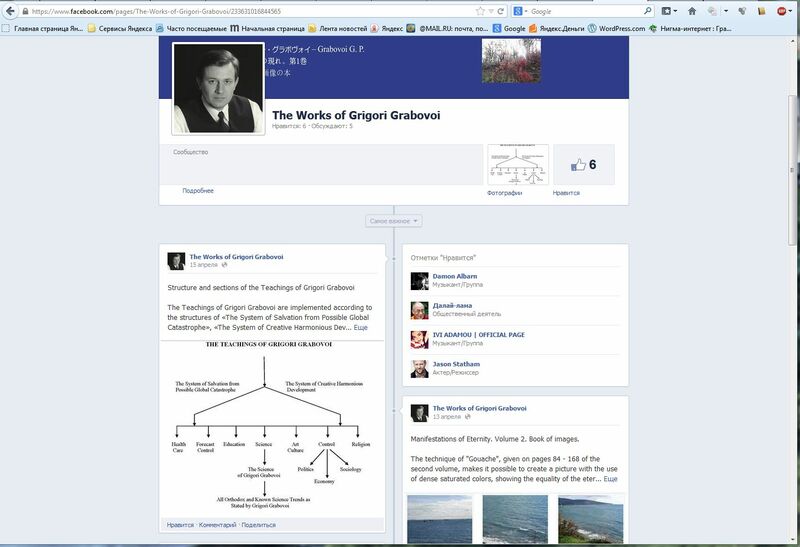 To ensure this the Teachings of Grigori Grabovoi include theoretical, methodological and practical parts. The practical part includes the results of application of the Teachings of Grigori Grabovoi for people to understand the reality of getting the results, extrapolation of which proves the possibility of ensuring eternal life by the Teachings of Grigori Grabovoi. 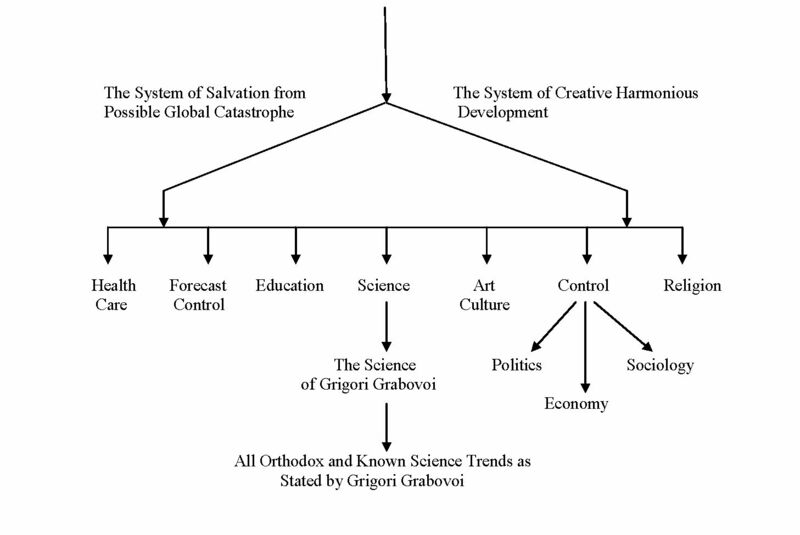 The theoretical part of the Teachings of Grigori Grabovoi is scientifically justified in his works: “Applied structures of the creating field of information”, “Unified system of knowledge”, “Research and analysis of fundamental definitions of optical systems in prevention of catastrophes and forecast oriented control of micro processes”, “Irrational methods of prevention of global catastrophic processes that represent a threat to the entire world”, “Education system of Grigory Grabovoi”, “Consciousness structuring”, “The principles of resurrection and every day life”. 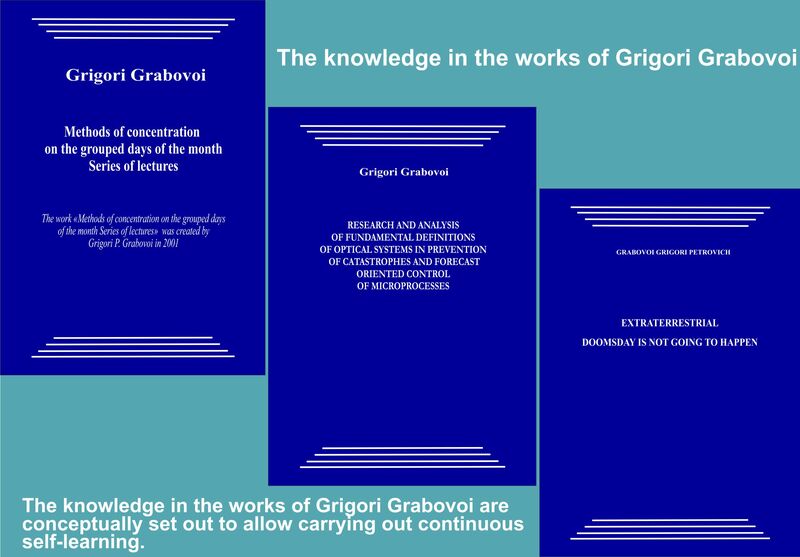 The knowledge in the writings of Grigori Grabovoi is set out conceptually in the form that makes it possible to carry out continuous self-learning. The author’s works of Grigori Grabovoi’s contain created by him knowledge of salvation and eternal harmonious development that cover the main areas of human activities. The knowledge control contained in these works passes to the practical level defined in the works. The theory of a new society, the core values of which are knowledge, information and creativity, the development of spiritual potential, ensuring the eternal life of all, gets the development in the Teachings of Grigori Grabovoi. The materials of the Teachings contain the developed informative and practical bases of control of eternal life knowledge, which can be described as a wide distribution of knowledge control in all fields of activity, including science and education. 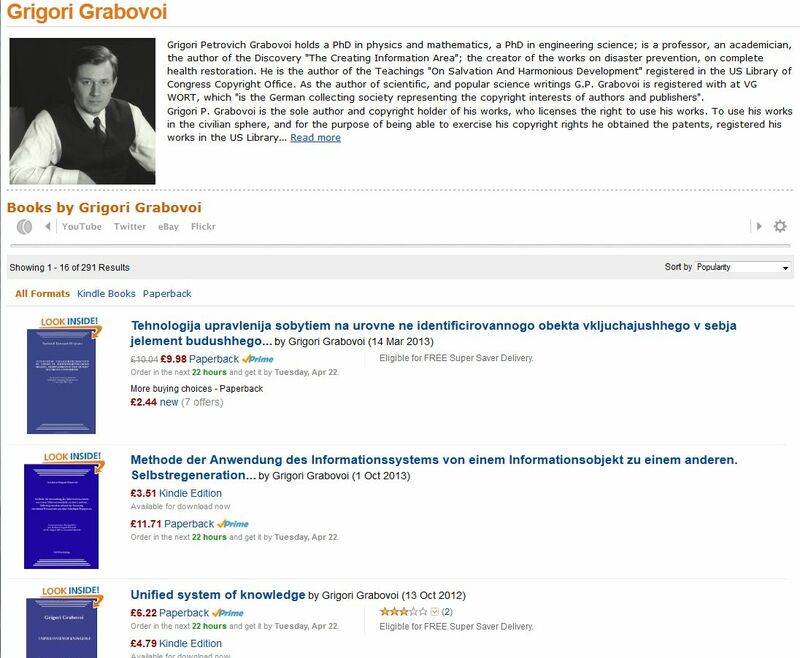 By the use of works of Grigori Grabovoi the direct formation of “the technology of knowledge control” takes place as a set of specific methods, techniques to ensure free circulation of the knowledge, their generating and sending them into the field of ensuring the eternal life of every person and all living things.